Taking a trip to Bali? 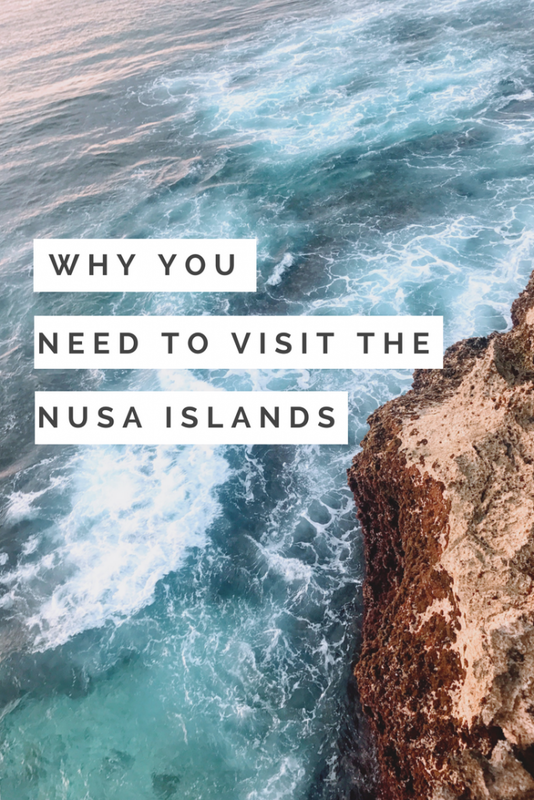 Read on to find out why you need to visit the Nusa Islands! As I began planning my trip back to Bali, after a one month stunt a few years earlier, the Nusa islands kept popping up on my radar. 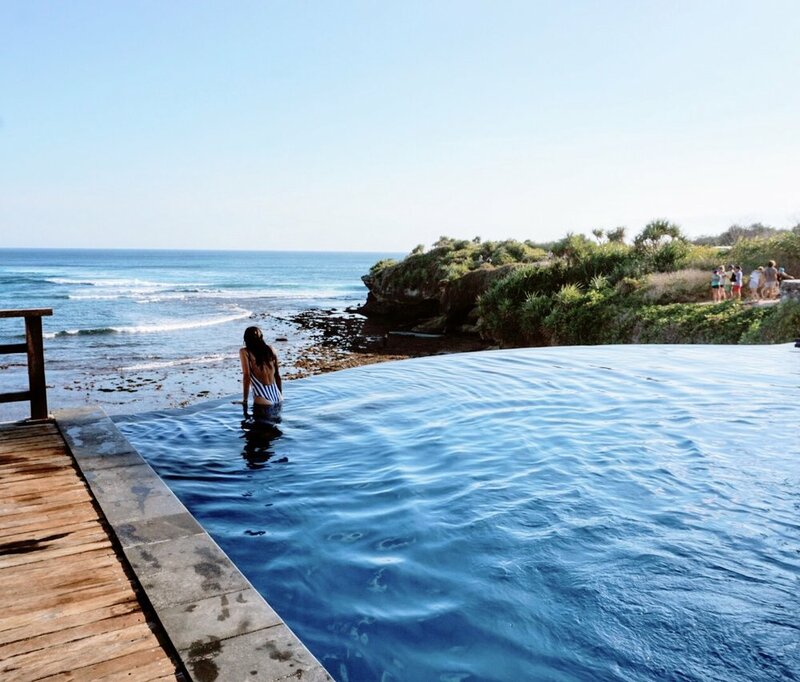 Located just 30 mins off the coast of Bali, Nusa Lembongan, Nusa Ceningan, and Nusa Penida are the perfect getaway! 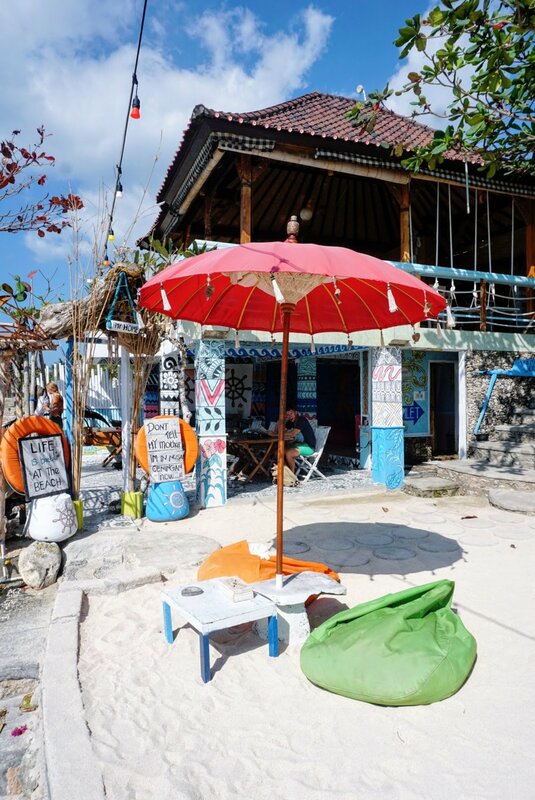 I decided to take 3 days to visit the Nusa islands of Nusa Lembongan and Cengingan. Nusa Lembongan and Nusa Ceningan are conveniently connected by a bridge. There are plenty of fast boats leaving daily from mainland Bali. I chose to cruise with a company called Rocky which charged 500K ($38) for a return ticket with hotel transfers. 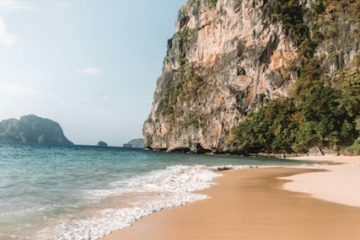 The following post is going to outline why you need to visit the Nusa Islands as I highlight my favorite beaches, restaurants, and activities! 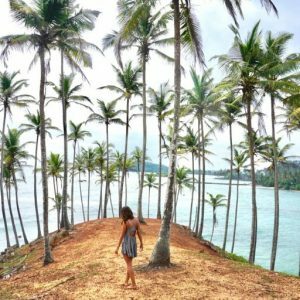 I found that the island was a bit pricy, however if you stick to local food and beautiful beach days you should have no problem sticking to a budget! The island is quite small, however if you want to see more (and get away from the large tour groups) then I definitely recommend renting a scooter. Most places rent for 60-70K/day, so it’s not a bad way to get around! Do note that a lot of the roads are quite bumpy so it’s not the best place for beginners! Snorkeling (or diving) is a must-do activity while on the island, and one of the reasons that you have to visit the Nusa Islands. There are plenty of tours starting as low as 150,000 K ($11) a person, however I highly recommend booking a private tour with Scooby’s. We were charged 250,000K ($19) a person for a group of four. Having a private tour meant that we were able to arrive at Manta Bay before the boatloads of other snorkeling tourists arrive. 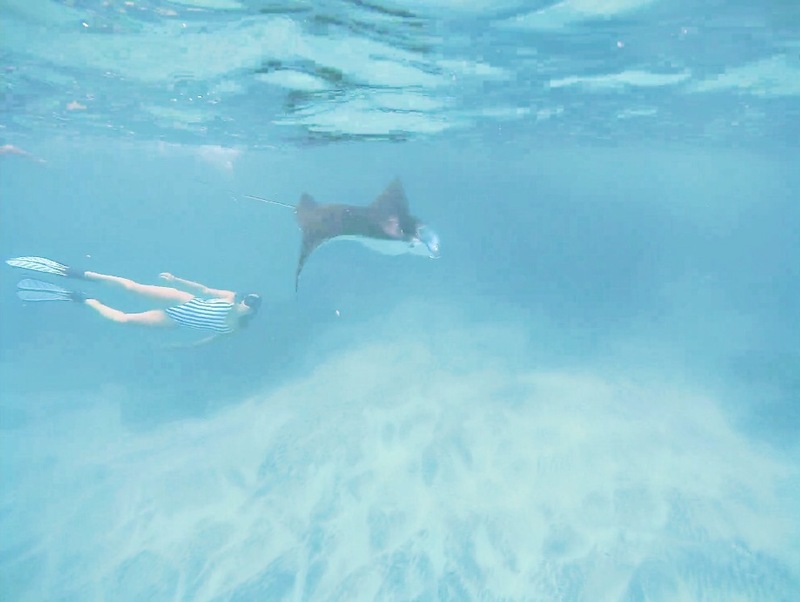 We were extremely lucky and had almost an hour alone with 7 massive manta rays before the other boats started arriving and scaring them off. It is truly an incredible experience! 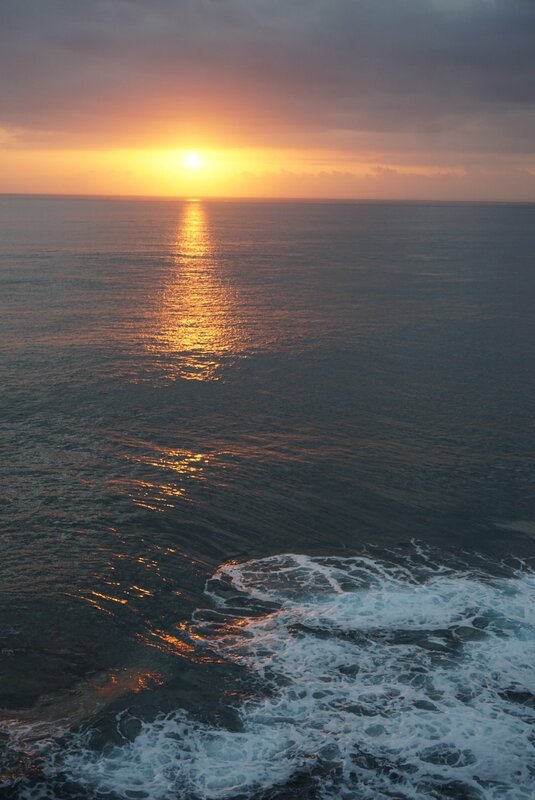 Located on Nusa Ceningan, this is your spot for sunset viewing, surfing, and cliff jumping. The sunset from Mahana Point is absolutely magical, as you watch the rough waves crash. There are beers, fresh juices, etc available for purchase. This is also a designated cliff jumping spot where you can pay 50K to jump. While the others that I was with loved the experience, I would only jump if you are feeling confident, as my uneasy and poorly landed jumped actually landed me in the hospital. 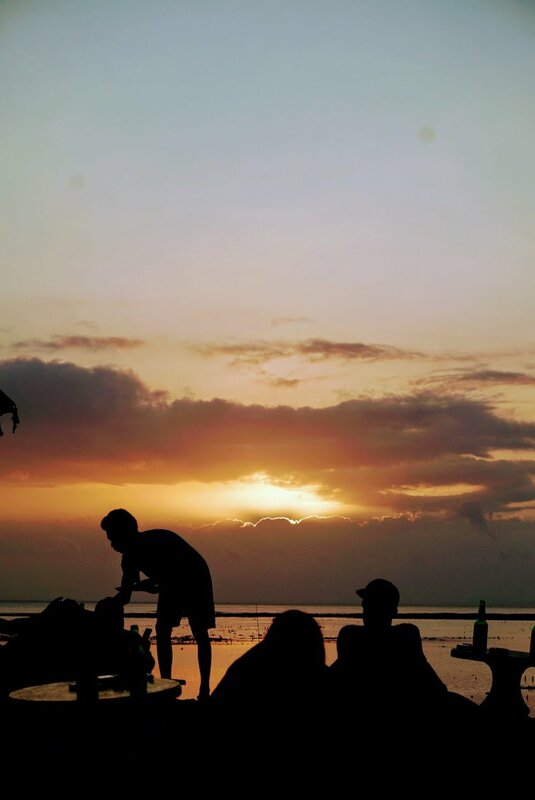 This dive shop/hostel is a great spot for catching the sunset. With bean bags laid out on the beach, you and your drink will have front row seats to an amazing sunset! There are so many incredible beaches on Nusa Lembogan to choose from! The following are just a few of my favorites if you don’t have time to explore them all! This was definitely my favorite spot when I visited the islands! You have to walk through the Sandy Bay Beach Club in order to reach the beach, but as long as you don’t plan on using their facilities they won’t charge you anything. The beach is secluded and absolutely beautiful! The waves are a bit rough for swimming but you can walk up around the left side for some awesome shots! Although this beach does get a bit crowded, it’s still a good spot to chill out. I found that the late afternoon was the best time to come because if you buy a happy hour cocktail from the cafe above, you get full access to their facilities – including the most amazing infinity pools overlooking the beach! Warning: you are going to find a TON of tour groups visiting this spot! That being said, it’s still a great view! Located on Nusa Ceningan, this beach is not the easiest to find, living up to its name. But if your goal is to get away from the crowds then this is your spot! It is located right behind the resort Villa Trevally. Overall I’ll admit that I was a bit disappointed by the food options on the islands. Personally I found all the best food to be small local warungs, but I guess that’s often the case! One of my favorites was a side of the road stand with an excellent 20K ($1.50) Nasi Campur. If you pass the more famous restaurant/guesthouse, Tigerlillys, on the left continue just down just a bit more You’ll find the spot on your left hand side. Check out the photo below for reference! Located on Nusa Cengingan, this is a fun, waterfront spot serving up mostly western dishes. 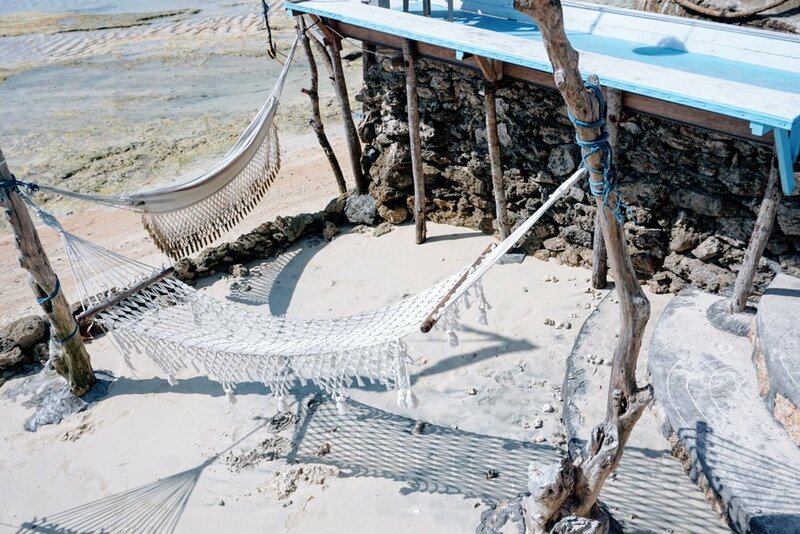 They’ve got bean bags, hammocks, and swings – an overall cool vibe! I ordered the yellow bowl and was definitely not disappointed! Lovely post! 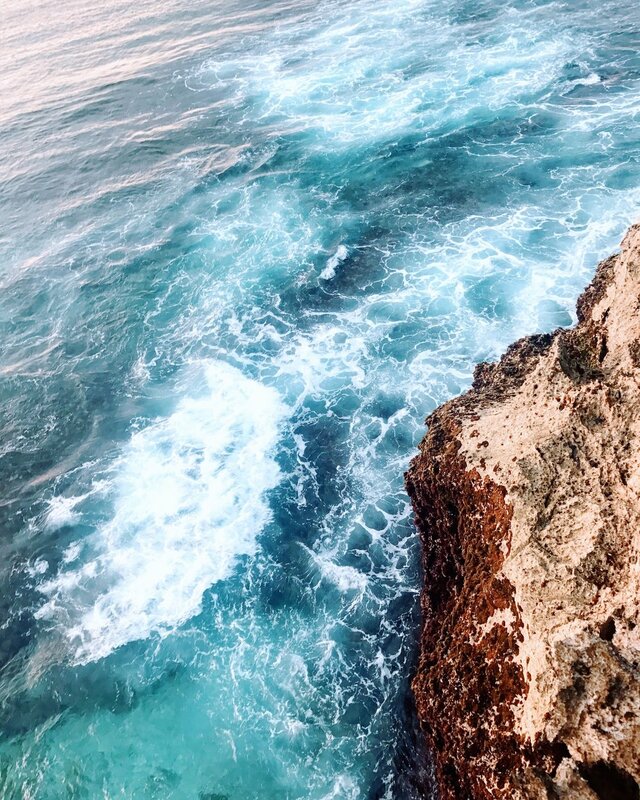 Your pictures are beautiful, I can’t believe how blue the sea is! I’ve always wanted to go snorkelling, it looks like you had a great time! A wonderful post. The island looks amazing. 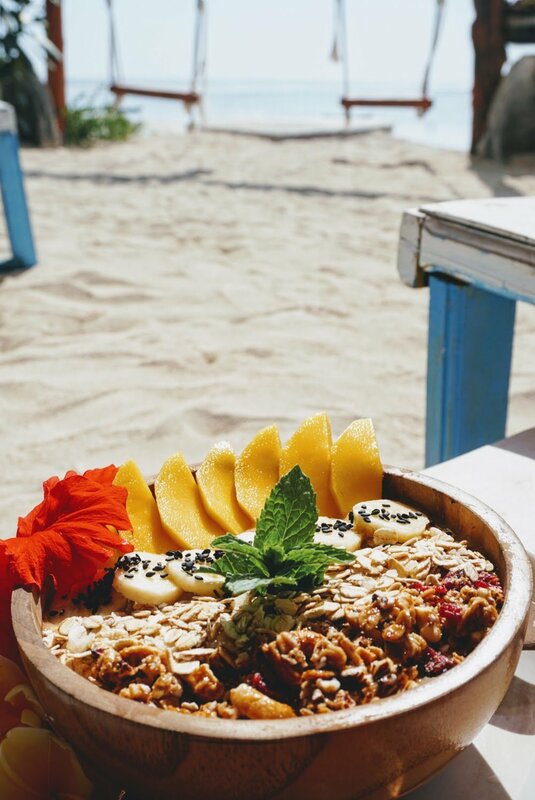 I was in Bali a few years ago and loved the beaches and the food. OMG those amazing sunsets <3 how not to love them! 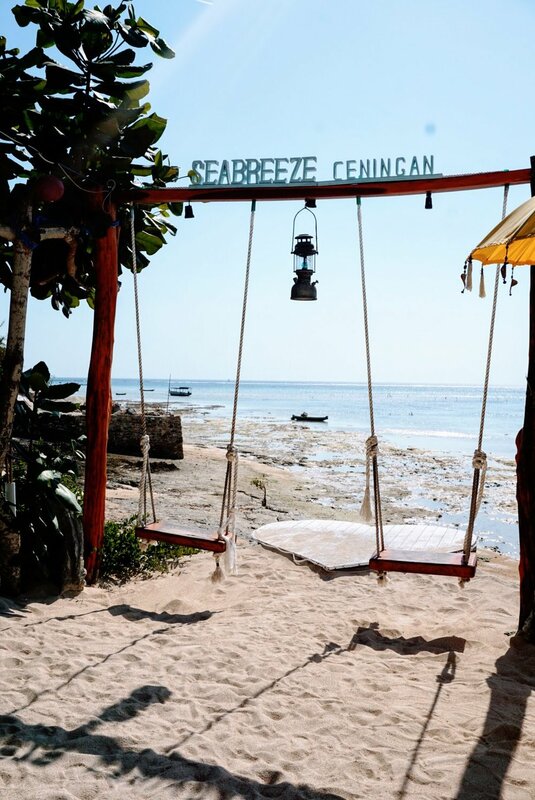 Beautiful photographs – Nusa Lembongan is one of my favourite places in the world, this brought back amazing memories! Yes – I have to agree with the comments so far. The photos do it justice, and more. I have never made it to this southern hemisphere country, but I certainly must make the effort to now. The islands looks amazing! We’re a big snorkel family, and just recently tried out sailing the Thai islands. I really appreciate the information you give about the different beaches, because we often found ourselves just guessing and heading for a beach, hoping it would work well for us. So much better to go in with better information! Lots of great info and lovely photos! Makes me want to visit Bali so badly. How long would it take to visit all these beaches? Wow, your photos are beautiful. They really make me feel as though I’m right there! I wish I was, haha. I have visited Bali but didn’t make it to the Nusas unfortunately – I hope to get there some day – and I’d definitely like to do some diving and snorkelling there, it sounds fabulous. Nusa Lembongan and Cengingan seems like a wonderful place for holidays!! Those sunsets and beaches are just so amazing! 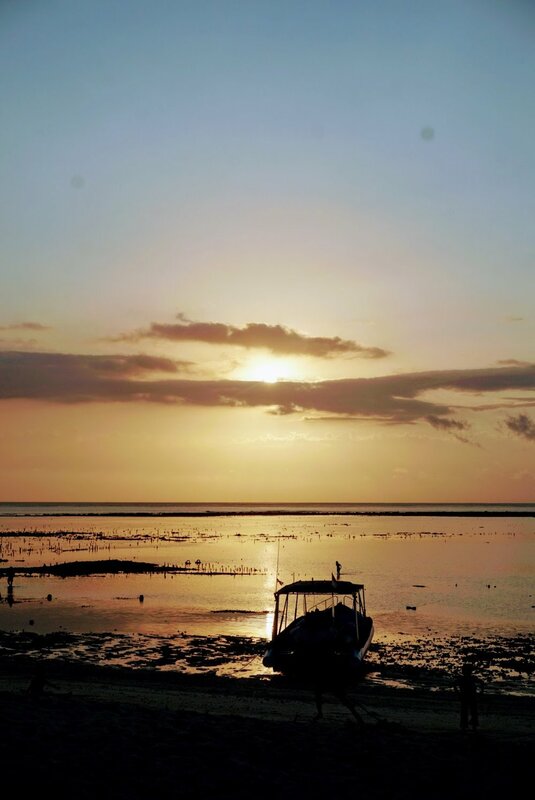 I am going to Bali in a two months but unfortunetly it’s a short trip so I won’t have time to explore anything around … but hopefully one day I’ll get to go back and see more. Love your photos! The pictures of the cliffs reminds me so much of California, especially San Diego and Sunset Cliffs! Thanks for sharing this gorgeous place!